Here is a puzzle I enjoy giving to students. 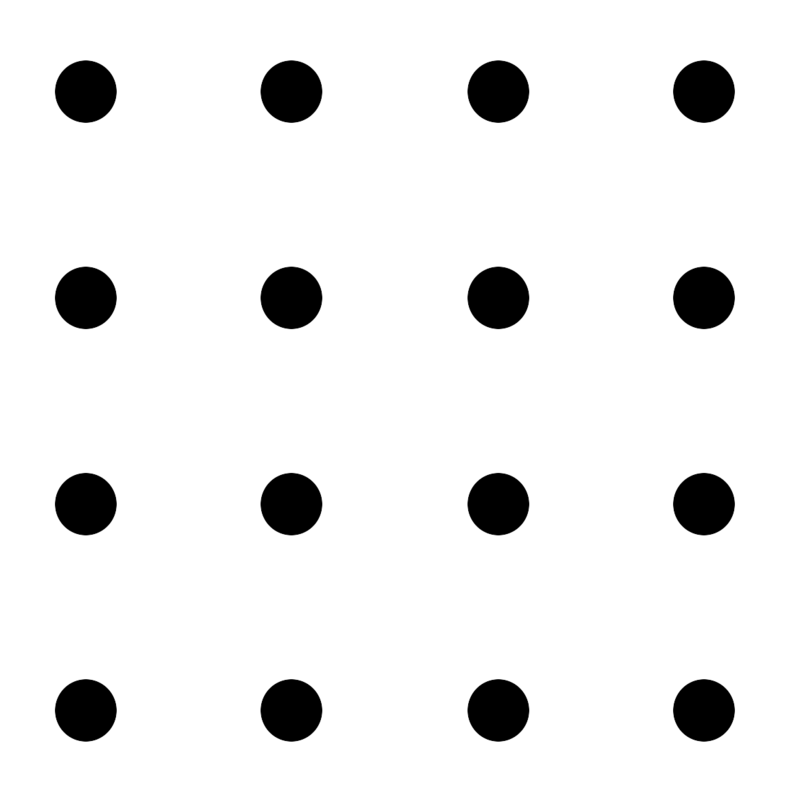 Given a 4×4 grid of sixteen dots, draw six straight lines that form a continuous path passing through all of the dots. Here, continuous means you must be able to draw over your six lines in one go without taking your pen off the paper. 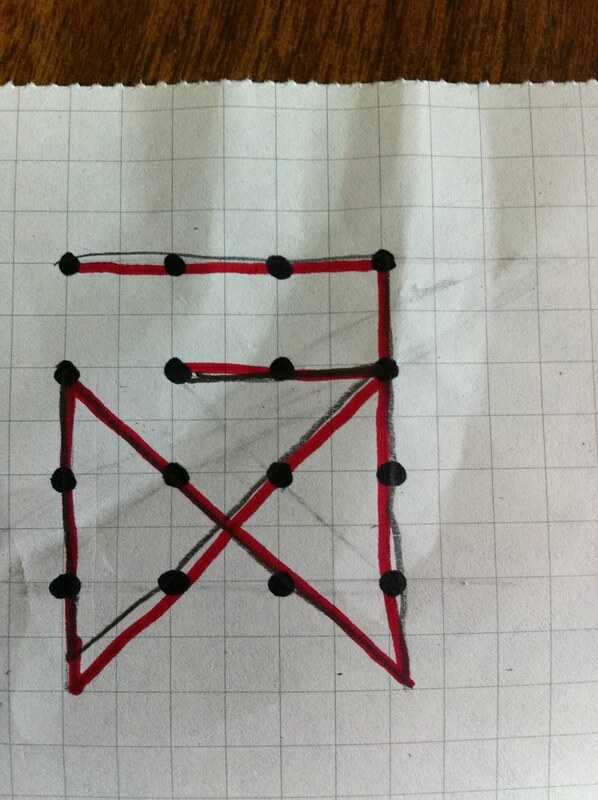 This task is easy to complete with seven lines and impossible with five. Six is where the interesting puzzle lies. I have given this to undergraduate students up and down the UK, and I have noticed a common response that makes me enjoy this puzzle and the lesson it teaches. Many students start playing with the puzzle, drawing lines on grids right away. This is good because playing is how you start to understand puzzles and by showing their thought processes I can look out for when they have misunderstood the problem. In my experience, this is a problem often misunderstood. 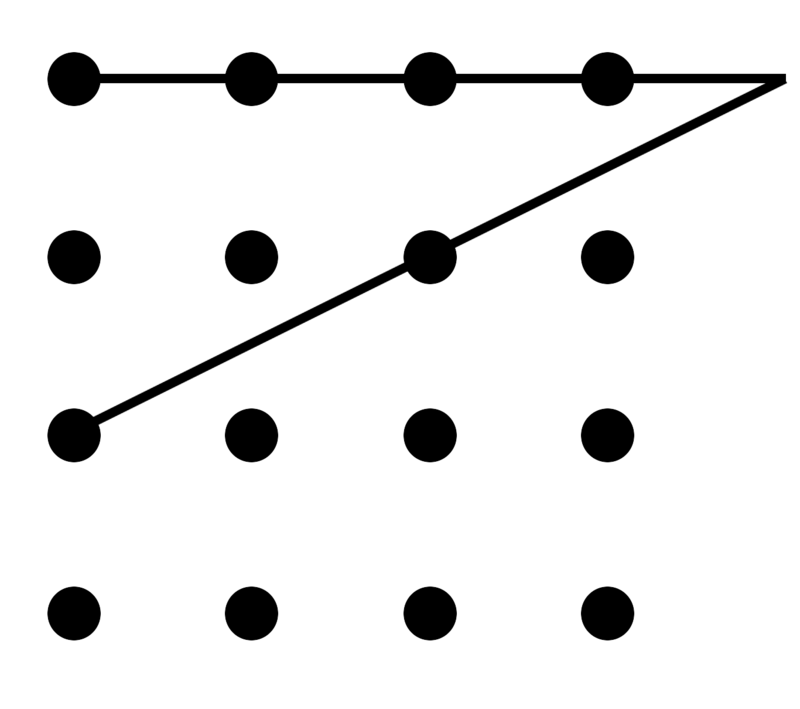 The statement of the problem was: “draw six straight lines that form a continuous path passing through all of the dots”. This says nothing to limit how you can move through the dots or where on the page you can draw your lines. In fact, I know of fourteen solutions to this problem and each of them involves a strange diagonal and leaving the confines of the grid. By imagining these additional conditions the student creates a new problem – one that cannot be solved. Good puzzles lie on a thin line between easy and impossible, and the particular wording in the statement of the problem is likely to be very carefully chosen to give you enough to solve it without being too easy. A would-be puzzle solver must check the wording to be sure they are attempting the puzzle that has actually been set and not some imagined, impossible version. This was written by Peter Rowlett. Posted on Saturday, August 20, 2011, at 8:07 am. Filed under By Peter Rowlett, Edited by Samuel Hansen. Tagged education, puzzles. Bookmark the permalink. Follow comments here with the RSS feed. Post a comment or leave a trackback. What does create my further interest in this puzzle, is your statement ‘I know of fourteen solutions to this problem’. Is there a way of calculating how many there are or a proof? Where would I find this answer, in topology? I would just love to be able to have the answer for the next time I‘m shown how ‘to think outside the box’. I remember reading about this puzzle (actually, the smaller 3×3 variant) years ago. A psychologist was writing about “out of the box” thinking and once mentioned the puzzle on public radio. He got a lot of mail because of it. @Paul & Peter: I gave a talk on this subject to the Maths Jam conference last year and when I submitted it, thinking I was quite quite original, I gave it the title “Thinking outside of the box”. When the event came round and I realised I’d given it that title I felt quite embarrassed. Now I am embarrassed all over again to learn it’s a team-building cliché! @Peter: I expect the 3×3 version makes the puzzle suitable for younger ages. Next time you are asked to ‘think outside the box’, you can ask how many continuous arcs are needed! 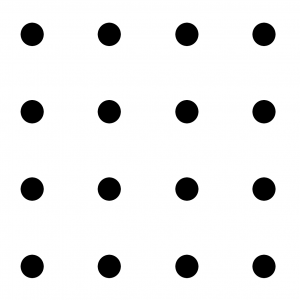 If you were given this on paper, you could roll it up into a cylinder and do the lot with one straight line (assuming the dots have some width). 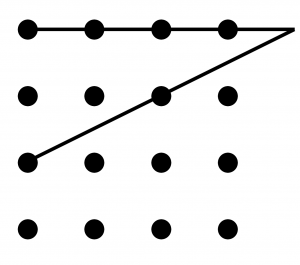 @peterrowlett Have you ever had somebody give the “one line” solution? I still find that amazing. @Christian and Peter: I’ve heard the cylinder answer before but not the “one line” solution. The latter is certainly audacious but both fall down because I think you have to take the dots as points and the lines as having no thickness! The man is an Euclidian! @Peter Extremely good point. Touché! @Christian I think I’d better accept this and Peter’s thick line solution as inventive approaches 🙂 Perhaps I’d better say I know sixteen solutions in future! Seriously, I think if a student gave either of these I’d be pleased with the thought process but still ask them for a conventional solution – even if I had to impose further conditions to get one. Peter, you know which one I am talking to, there is another ingrained restriction that I just found myself hitting up against: Passing through the same point more than once. I am terribly bad at puzzles, especially spatial ones, but after many tries sitting at a picnic table at this campground in Northern Nevada I finally came up with a solution for this, but it crossed through a dot more than once, which initially I thought was not kosher but after retracing the problem statement I beloved is actually fine. So I guess I fail as editor as I should have noticed this and told you to talk about it as well. @Samuel I would be interested to see your solution. None of the fourteen in my puzzle book involve crossing through a dot more than once. I thought that this was not forbidden by the rules but that doing so would naturally preclude a solution. Samuel, This one isn’t among the fourteen in my book (as it is, or rotated or reflected). I’m staring at it trying to find something wrong or some way to do the equivalent thing without doubling through the point, but I think it looks good to me. Put simply, there is only one solution in my book that has two adjacent sides in an L like yours, and it’s slightly different. An advanced version of the puzzle in the book I have asks you to find those solutions with minimal intersections and gives four with only two intersections. I think yours is a fifth.